Serve up a popular classic soup this festive season. Corn and crab meat soup is easy to prepare and hearty without overwhelming the palate. In Mandarin, corn is yu mi which means jade rice. In the book, China On The Sea: How The Maritime World Shaped Modern China, author Zheng Yangwen writes that the term "jade rice" suggests corn was prized by the Chinese. In the 18th century, peasants decorated their homes by hanging corn cobs below their roofs to signify abundance and even wealth. If you do not fancy hanging corn cobs from your roof, a more practical use for corn cobs is to use them for cooking stock. The cobs impart an incredible sweetness. 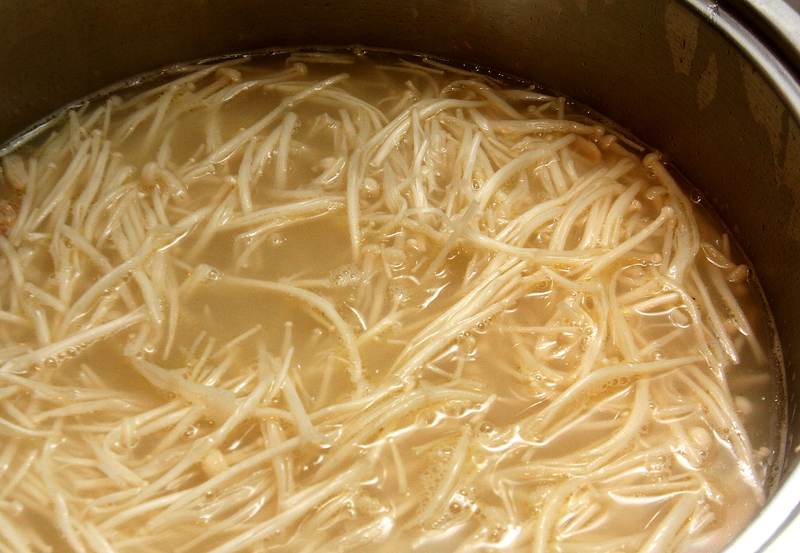 For the soup, I used pasteurised crab meat, and threw in enoki mushroom and leek for extra texture, colour and flavour. 1. 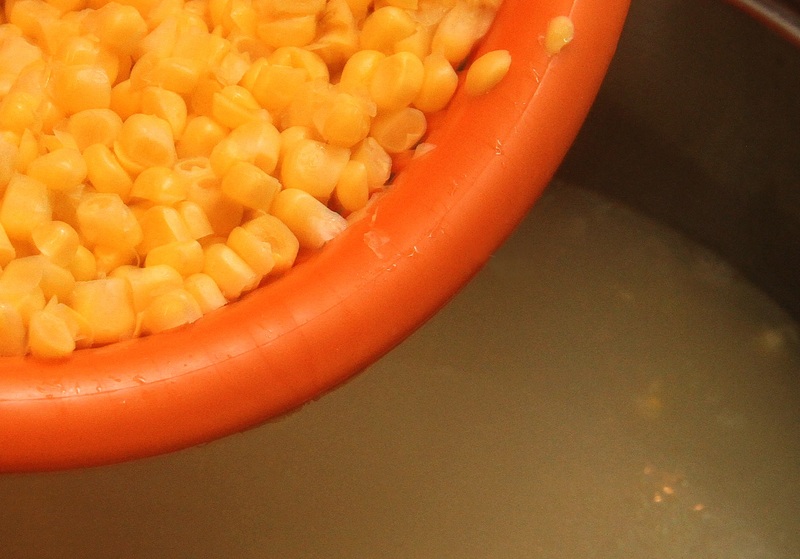 Remove the husk and tassels from each corn cob. Rinse and remove any remaining tassel. 2. Cut each ear of corn into thirds. 3. Cut the corn kernels off each piece of cob. Place the corn kernels in a bowl. Set aside the cobs for boiling the stock. 4. Rinse the chicken carcasses and trim off any visible fat. 5. In a pot, bring two litres of water to boil. Blanch the chicken carcasses until there is no visible blood. Discard the water. 6. 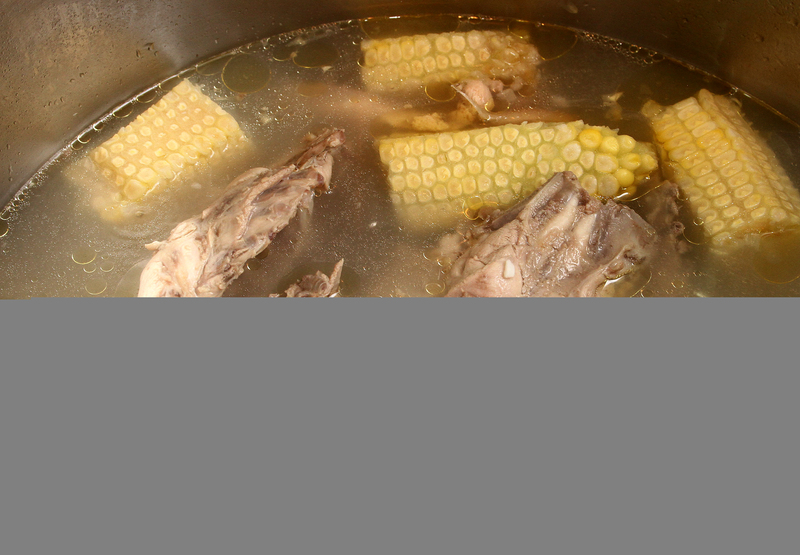 Place the blanched chicken carcasses, corn cobs and five litres of water in a large sturdy pot. Add the six garlic cloves and 30g of smashed ginger. Bring to a boil on high heat for 30 minutes. 7. Lower the heat to medium-low and continue to boil for 1½ hours. 8. Once the stock is done boiling, use a sieve to filter the chicken stock into a clean pot. Reserve the stock, discarding the stock ingredients. 9. To prepare the soup, bring 2.5 litres of chicken stock to boil in a pot. 10. Add in the corn kernels and boil for 20 minutes. 11. Add in the enoki mushroom. 12. Add in the grated ginger and pasteurised crab meat. 13. Add the ground white pepper. Cover and bring to a simmering boil. 14. Stir in the egg whites and allow the soup to come to a simmering boil. 15. In a separate bowl, mix 3 tablespoons of potato starch with 3 tablespoons of water. Stir in the potato starch mixture into the soup to thicken it. 16. Season with salt and bring to a boil. 17. Add in the sliced leek. Cover and let the soup come to a simmering boil. 18. Serve hot, garnished with spring onion. Yields 10 servings.